The Camp Fire in Butte County was the state's deadliest fire, with 88 dead as of Nov. 27. 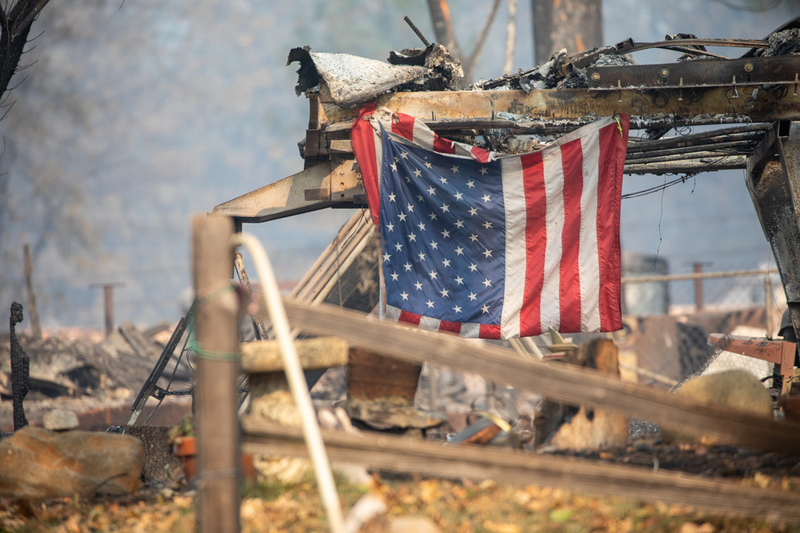 The first inkling that Butte County Supervisor Doug Teeter had of the Camp Fire was seeing “whole black leaves, about the size of quarters, falling from the sky.” Gale-force winds were blowing that day at about 50 MPH in some areas. The deadliest fire in California history, which began the morning of Nov. 8, has killed at least 85 people as of Nov. 25 and left hundreds unaccounted for, authorities said. Teeter began seeing the leaves floating in the air early that morning, after receiving a text about a small 10-acre fire. But the fire quickly grew and 10 days after it started, it had burned more than 148,000 acres, destroying nearly 12,000 structures (including about 10,500 homes) in the county. The morning the fire started, before it ripped through the town of Paradise, Teeter’s wife took their children to school; shortly after, he received an evacuation notice on his phone. Soon, they were both heeding the warning. Teeter, a longtime resident of Paradise, sent his wife ahead to go pick up their children; he later jumped in the family’s second car. But soon, he was stuck in a traffic jam with other drivers also trying to escape the blaze. He left his car on the side of the road with plans to run on foot back home to hop on his motorcycle. Instead, he banged on the window of a truck that belonged to a CalFire firefighter. As the blaze closed in, the firefighter drove them into a clearing that was free of trees and brush. They signaled other cars to join them. “People just want to know we’re going to rebuild Butte County,” Teeter said. Some county buildings were still standing after the fire including the library and the fire station, he said. Before the fire leveled the town of Paradise, the housing vacancy rate in the county was somewhere between 1.5 to 2.5 percent, said Ed Mayer, executive director of Butte County’s Housing Authority. Authorities said the Camp Fire, named for an area of Camp Creek Road, was expected to continue to burn for another week. The Mercury News reported that firefighters, dispatched to the scene, discussed power lines that were down in the area. The utility announced before the fire that due to a forecast of high winds and low humidity, it was considering shutting down power to parts of Butte County, but it never did, the newspaper reported. CalFire said the fire is still under investigation. Napa, Sonoma, Lake and Mendocino counties are suing PG&E for its role in deadly wildfires that plagued the region last year. Rain helped contain the fire on Nov. 25. The county is keeping lost animals at the Chico airport and has started a webpage with their photos that includes dogs, cats, guinea pigs and a cockatiel. An ashy haze from the fire has blanketed the region. Sacramento County fire stations were handing out masks for safety concerns, but the county’s Health Services director, Peter Beilenson, said that they decided to stop handing them out because they give a false sense of security. Instead, the county is urging people to stay indoors. Experts from Berkeley have said breathing in the air in the region is equivalent to smoking a half a pack of cigarettes a day. In the area near the fire, it’s equivalent to a pack a day. The National Oceanic & Atmospheric Administration showed the worst of the smoke to be near San Francisco and Sacramento, with between 60-100 micrograms of smoke per cubic meter of air. In addition to the Camp Fire in Butte County, Los Angeles and Ventura counties were also battling wildfires. The Woolsey Fire, which also started Nov 8, was fully contained by Nov. 21, burned 151 square miles across the two counties and destroyed more than 1,600 structures, many of them homes according to CalFire. Three people died and three firefighters were injured.